A New York City native, I have lived in San Francisco and Monterey, CA; San Antonio, TX; Ridgefield, CT, Syracuse, NY and Boston, MA. I now live in Amsterdam, NL. However, New York, NY remains one of my favorite places in the world. While living in beautiful Monterey, California, I discovered two of my other passions: running and sailing. I began running early in the mornings along the Monterey Bay. It was my time to be by the ocean. Within several months I was hooked. Since those days I have run the Berlin Marathon once and the New York City Marathon ten times. The Marathon showcases NYC and its people in full splendor and makes me proud to be a native. I took a basic sailing course just for fun and almost immediately sailing became a passion. 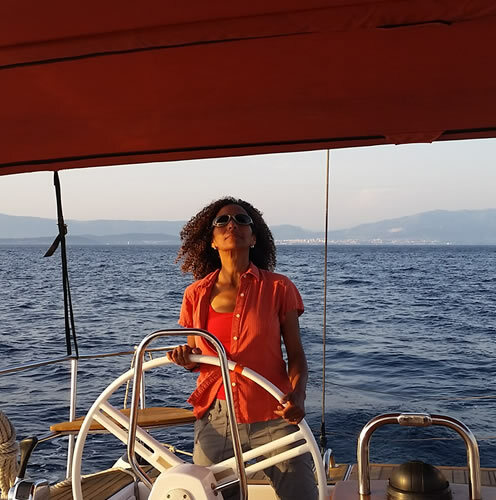 So far, I have sailed in the Mediterranean, Adriatic and Aegean Seas, in the Grenadines, up the Atlantic Ocean from the Caribbean Sea and of course, in New York Harbor. Travel is yet another one of the absolute pleasures in my life. My travels have taken me to Eastern & Western Europe, Turkey, Thailand, Brazil, the Caribbean and Mexico. To immerse myself in different countries, interact with locals, learn something about their customs, culture and cuisine gives me a wonderful sense of connection, renewal and growth.